In a move to stay competitive and at the cutting edge of technology, CNN has announced the launch of their new virtual reality news unit called CNNVR. In their words "a new immersive journalism unit and virtual reality platform within CNN Digital." Don't expect the service to replace your TV's nightly cable news anytime soon, for now it will just be focused on special content and individual events. 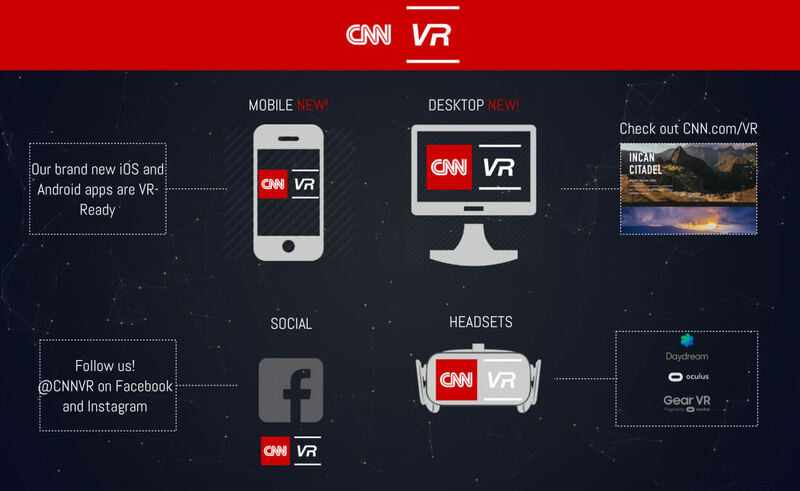 The CNN mobile app is now set to display 360-degree content, which they claim will make them the third largest VR mobile app behind Facebook and YouTube. In addition, PC users can also view specialized content online. Currently they have reports on The Running of the Bulls, attacks in Aleppo, a wild animal sanctuary in Colorado, with more to come. CNN is also planning to livestream major events as well as producing a weekly VR program. They have been experimenting with VR for the past few years including coverage of the US inauguration and the Democratic presidential debate. By creating a dedicated VR team, CNN is hoping to attract a more tech-savvy audience and transport them right into the middle of the action. The unit will have support for multiple VR headsets including Samsung Gear VR, Oculus Rift and Google Daydream.